Rio de Janeiro: Brazilian Ivonette Balthazar felt jittery ahead of a Rio de Janeiro road race on Sunday, but her heart – transplanted from a German Olympian a year ago – spurred her on. 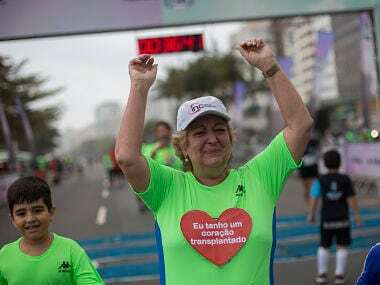 In the midst of a long recovery from a transplant operation last year, the three-kilometer (1.9-mile) fun run alongside Rio's Copacabana Beach seemed like a marathon to 67-year-old Balthazar. That heart, though, wouldn't let her sit back. "The heart of an athlete beats inside me, the heart of a young person," she said at the start line. "This heart demands more from my body than I was used to." So, dressed in lycra and purple running shoes, with the number 2799 and a big red paper heart pinned to her shirt, Balthazar set slowly off with hundreds of other competitors down the famous seafront. Only 13 months ago, while her home city was hosting the Olympics, Balthazar faced imminent death. Her heart – ravaged by smoking, years of stressful work at her human resources agency, and a heart attack in 2012 – registered barely 40 beats a minute. Although she'd risen to the top of the waiting list for a new heart, it seemed too late. Then on 15 August, 2016, she got a call from Rio's heart hospital, the Instituto Nacional de Cardiologia. 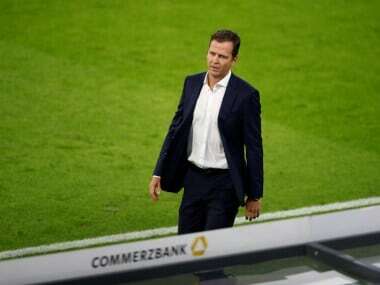 Stefan Henze, a German Olympic canoeing team coach and winner of silver in the 2004 Athens Olympics, had died in a car accident – and Balthazar was assigned the 35-year-old's heart. Ever since, she says she and Henze have become a team of sorts. On Sunday, she put that partnership to the test. "If I didn't have this heart, I wouldn't be running," Balthazar said. "This race today is a challenge for me – and for him." Although she has regular physiotherapy at the hospital, the race was Balthazar's first major unmonitored physical outing. Nervous about how she'd hold up, she decided to walk, not run. But Balthazar grew visibly more confident, her pace increasing until she moved at a brisk stride. Tears of joy welled up when she reached the halfway mark – then flowed at the finish line. Even on the happiest days, Balthazar is aware of the inseparable sadness, often thinking of Henze's family. She'd love to meet his mother, "to hug her and thank her," Balthazar said, mindful however that this might be too upsetting for his relatives. While she celebrates daily victories, "on the other side there is an entire family crying," Balthazar said. So she does her best – for herself and for her silent partner. "The two of us are here," Balthazar said. After the race, she embraced her own elderly mother, her daughter and grandchildren, before posing for photos with the race medal around her neck. Anyone finishing could pick up a medal – but it really meant something to Balthazar. Copying a gesture often seen on Olympic podiums, she bit down playfully on the metal prize. 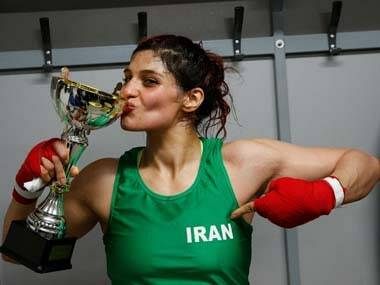 "This is a gold medal for me," she said.